The development also would include 4,000 square feet reserved as community space, and would create parking spaces for 1,900 vehicles. The project would retain the existing commercial building at 156 Oak St. that was built in 1900, while the remaining buildings within the project area would be knocked down, according to the filings. I haven’t followed this project as closely as I should have. It’s a biggie, that will have ripple effects throughout the Newtons. The thing that jumps out at me right away… 822 apartments, but only 123 affordable units. Northland is gonna have to do better than that. It’s a rare opportunity for the city to put up a desperately needed elementary school. They should take a couple of acres (probably near the old rail station) for an Emerson replacement, so Countryside won’t be the trailer park of modulars that it is now. If they don’t, then the 822 apartments will just worsen the overcrowding at Countryside or Zervas. Mr. Goldstein is absolutely right. Any major development of Northland property on Needham Street should include space for a new school to accommodate the new students from the development as well as the students from Upper Falls who are now sent to as many as three different schools from three adjacent houses and those from the convenient sections of Newton Highlands, the Avalon Development on Needham Street, and the Charlemont section. The Northland plan includes a “public gathering place”. Sounds to me like what a school should be. Anther key issue will be the position of the members of the Upper Falls Advisory Council (and of the vast majority of Upper Falls residents) that the vast amount of additional traffic that any development of the scale that Mr. Striar cites should not be put onto the narrow streets of Upper Falls via Oak Street, The elimination of school traffic to and from Upper Falls to elementary schools outside the village would be only a small first step in this direction. 822 units and parking for 1900 cars. Ugh! The surrounding streets including nearby highways (128 & rt9) are already a nightmare from 2:30pm on and in the am. A new school would definitely be needed. A new school (building plus on going salaries) would mean a tax override right? How about the developers(if rental) or buyers pay a high density property tax surcharge to pay for the new school.? If the increase is coming solely from a single development rather than spread out evenly… is this not reasonable? Let’s see if our City Council and affordable housing advocates will push for more…. I’ve been suggesting for many years that Newton could create more affordable housing through hard-nosed negotiations with developers rather than 40B. Amy Sangiolo proved that point at Austin Street. In my opinion, 30% of the residential units in this Northland project should be affordable. That’s the number the City should be pushing for. I think people are correct to be concerned about this project’s impact on schools. Along with increased traffic, those are the biggest impact issues. It’s unrealistic to expect the developer to fund a new school building. And I can’t see the City seeking an override to build one. But I did notice that the proposal includes almost 200K sf of office space. Depending on site design, it may be viable for the developer to lease some of that space to the City for a school. @Mike – would it be unrealistic to expect the developer to set aside a parcel of land for a new school building? @Meredith– I’d really need a full understanding of the current proposal before I could answer your question. But the Northland project is clearly a great opportunity for the city to use some strong negotiation and a little out-of-the-box thinking in order to augment Newton’s educational offerings. I’d previously proposed that Cabot, Cabot and Forbes provide free rent to a STEM magnet school in exchange for the City lifting its Deed Restriction on Wells Ave. I’m thinking something along those lines might work even better in the context of this Northland development. As a bike rider and fair-weather commuter, this article makes me very sad – https://www.bostonglobe.com/opinion/2019/01/08/bike-lane-fever-breaking/rfTB2bSH9XxO07NAmP4S3I/story.html. However, the fact is the bike ridership is declining and most of us know, is quite dangerous. So – lets STOP acting like these 822 units or 600+ at Riverside or Washington Street is going to be traffic neutral because people will commute via bike. 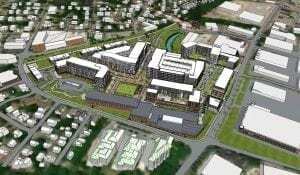 Lets just stop it, and acknowledge that we are going to create traffic gridlock and include that in determining if these mega-size projects are viable in Newton. PS – Would appreciate if V14, starts a new thread about this.